If it’s your first time renting a dumpster for your major remodel or spring cleaning project, we’ve got a guide that won’t waste your time in making the right decision on renting your first roll-off dumpster. What Size Dumpster Does Your Project Need? You should choose your dumpster based on the job you need it for as well as on how much space you have to fit the dumpster. Generally, it’s best to choose a larger dumpster than you think you need because it may help avoid overage charges or the cost of needing a second dumpster later. Be sure to measure the area you would like to place your dumpster before ordering so you know what dimensions are most appropriate for your area. What do you do to prepare your home for your dumpster rental? When will the dumpster be delivered? Do I need to be present for the delivery? Where should I place my dumpster? Is there enough room in my driveway for my car? Can I avoid placing it at the end of my driveway where it may block the view of drivers and pedestrians? Will it block any doors? Is there enough room at the walk-in end of the dumpster for easy entry? Where will the route be to get to and from my dumpster? Will it trample flower beds or create unwanted footpaths on my lawn? How do I fill my dumpster? Keep in mind that you are renting someone else’s property, like when you rent a car, so you are responsible for that property while it is in your care. This means that everything that ends up in the dumpster by the time it’s removed—whether you, your neighbor or a stranger put it there—is your concern. A dumpster rental can come with additional charges if you don’t follow the rules associated with the waste industry. Please be specific when telling us what you intend to put into the dumpster to make the ordering process smoother. We’ve provided you with some acceptable and unacceptable examples for what you can put in your roll-off dumpster. 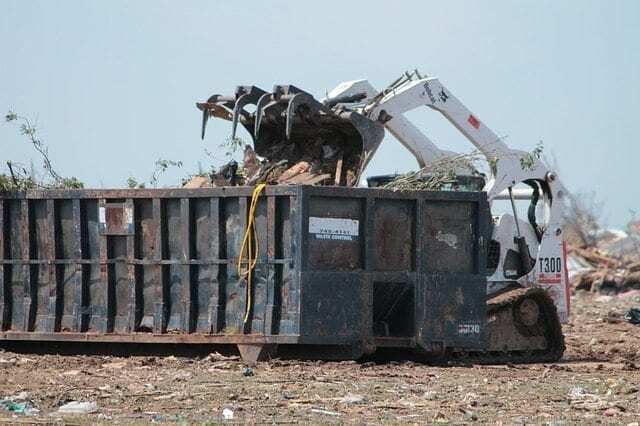 Consult with us to determine the exact cost to dump your materials or if you have additional questions about what you can or cannot dump. When should I stop loading the dumpster? When your discarded materials are at the same level with the top of the dumpster is a good stopping point. Don’t risk spillage on your driveway during pickup and as your dumpster is leaving just to try and squeeze in those last few items. Once your dumpster is full, contact us. How much notice do I need to give for dumpster removal? Do I need to be present for the removal? What do I do when I'm done? Sweep off your driveway to avoid a nail or piece of glass piercing your tire or a child’s foot. Now that you’ve got a project, a rental guide and found your dumpster company, give Bargain Dumpster a call and we’ll get your dumpster rental on its way! Bargain Dumpster provides dumpster rental services Nationwide. Give us a call today we can help answer any questions you may have!